Interested in teaching kids about animal habitats? Experimenting with dry ice? Exploring the relationship between kinetic and potential energy? If you answered yes, the Science Fellows program is for you! Positions open in two North Adams schools in K-5 classrooms. Science Fellows collaborate with classroom teachers to lead interactive science lessons weekly during the fall and spring semesters. Students participating in the NAPS Science Fellows program are part of the North Adams Teaching to Learn initiative funded in part by the National Science Foundation. In addition to the weekly science teaching, NAPS Science Fellows attend trainings and participate in Teaching to Learn project research and evaluation. Curriculum units and materials provided. No science background necessary. Science Fellows working in North Adams schools teach one science lesson each week and participate in related program activities. 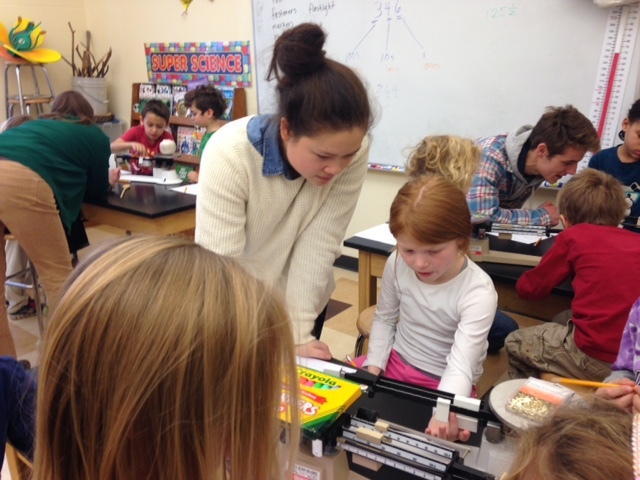 As part of the Teaching to Learn initiative, these activities include attendance at orientations, participation in periodic trainings focused on effective science teaching, planning time with teaching partners, and weekly debriefing with North Adams teachers in whose classrooms Science Fellows work. For any further questions, email Molly Polk.